First off, what the heck is a Post Excerpt? Great question! An excerpt is a shortened summary of a longer article/post. This summary is displayed on the blog main page, along with a link to the full post. A post excerpt can be added or modified by editing the given post within the Shopify admin, and is found under the label Excerpt. Note that if you wish to completely customize a post excerpt, you can always do so by editing the Shopify post and setting the excerpt to whatever you wish. Just be aware this is a manual procedure, and one you might need to perform for every imported post, so generally it's better to use one of the more automated solutions described below. Use the post description returned by the feed, otherwise automatically generate a summary from the post content - This is the default behavior and will use the post summary/description returned by the feed, if it includes one, otherwise BlogFeeder will automatically generate one using the first 400 characters of the post or so, along with any images. Automatically generate a summary from the post content, and ignore any post description returned by the feed - This will cause BlogFeeder to always generate the post summary based on the first 400 characters of the post content or so, along with any images. Use the post description returned by the feed, otherwise don't create a summary - Use this option if you want the post excerpt to be completely controlled by your native blogging platform; BlogFeeder will just use what it finds in the feed. Never create a summary - This option is useful if you happen to have a theme that will automatically display an excerpt from the post, or if you want the full post to be shown on the blog main page. Do you want the entire article content displayed on the blog main page, or do you have a theme that formats the article excerpts on the blog main page very specifically? Do you want a shortened summary (excerpt) of the article content displayed on the blog main page? If you don't like the post summary returned by the feed for whatever reason, and like having the first 400 or so characters along with any images used for the excerpt, choose Automatically generate a summary from the post content, and ignore any post description returned by the feed. 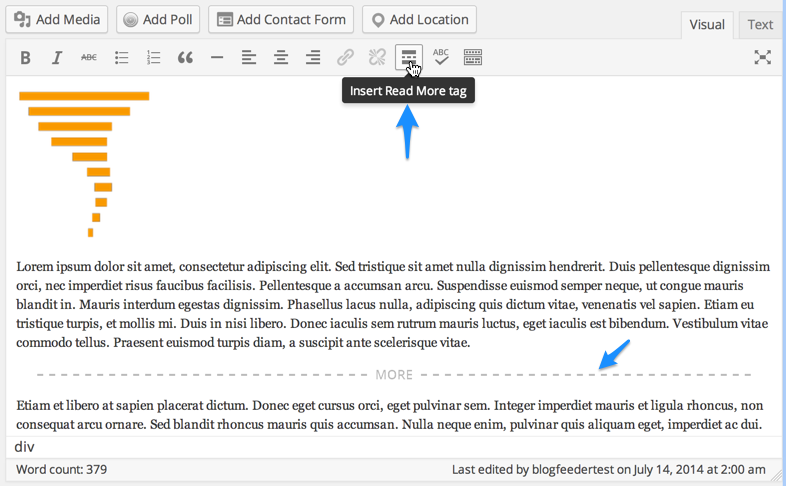 This option is commonly used for WordPress feeds, which don't typically include images in the post summary. If the above options don't give you exactly the result you're looking for, for instance the excerpt just doesn't quite include all the text/images you want, you can set a manual excerpt cutoff point within the blogging platform that your feed is pulled from. Why isn't my post excerpt displaying as expected? Then you know the theme is ignoring any post excerpts and generating its own based on the post content. Perform any required edits to get the result you need, or drop a line and one of our support agents will be happy to assist!